The latest title in the Reacher series and some of the others on my shelf. The weather is changing, and in a week it will be autumn, to be followed eventually by winter. Long evenings with nothing on TV. So you’re gonna need something to read. Here’s a recommendation if you don’t want Literature with a capital L. If you want to avoid anything that makes you angry or sad. Or makes you drift off to sleep. If you just want to enjoy yourself with a story and swift writing, you won’t go wrong with Lee Child. Child has written 20 novels about his character, Jack Reacher, a former MP in the U.S. Army. 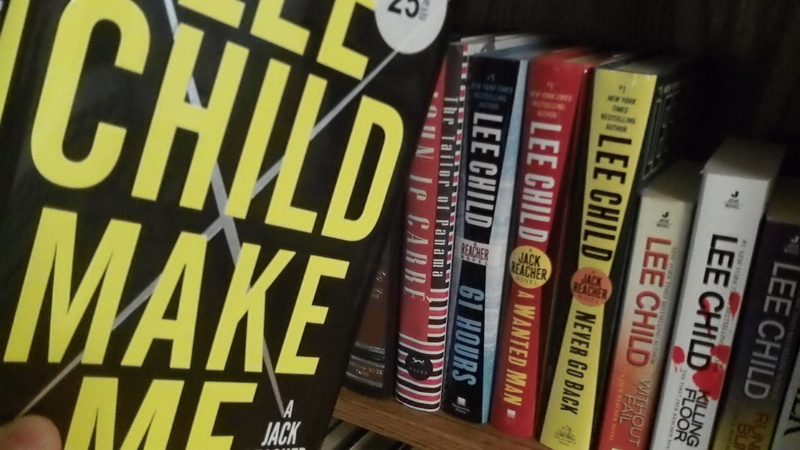 Reacher wanders around the country. He has no home, no car, no luggage and no driver’s license. Every few days he buys new clothes and throws the old ones away. Only his shoes he keeps. They are old, but they are good. Top quality shoes. Made in England. Reacher does have a passport, a bank account and an ATM card. The only other thing he has is a toothbrush he carries in the pocket of whatever shirt he has just bought. He has one more thing: a nose for trouble. He is 6-5 and weighs somewhere north of 200 pounds, so most trouble is not a lot of trouble for him. Nothing he can’t handle. Everywhere he goes he meets a woman. Together they hunt down killers who are truly evil. Maniacal even. And usually doing their evil in little towns somewhere in the middle of the country. Far from everywhere else. The stories don’t make a lot of sense in terms of logic. Actually, they make no sense at all if you think about them too much. But that would be a mistake, thinking about them too much. The writing is snappy and fast. And fast writing means fast reading. To finish these books takes two nights. It may take three if you don’t want to stay up late. My reading project this summer was to get through the Jack Reacher series. I’m currently reading #17, A Wanted Man. Lee Child keeps you riveted until the last page. What a roller coaster ride. I too enjoy the Jack Reacher stories. I found Lee Childs after I had finished all the Mickey Spillane books. Fun reads!